I had to put the embroidery down for just a minute. It has been fun and I like the therapeutic nature of zoning out while I stitch, but I had some other projects on my mind. You know how it is with some projects. It’s not that you don’t want to finish them, or that you don’t like how they are turning out, it’s just that something else has piqued your interest. For me, that was a project from Anna Maria Horner’s book, Seams To Me. Yeah, I know you are probably sick and tired of hearing about this lady and what she does. I just can’t get enough and I loved this project from start to finish. Plus, I ended up learning how to do some new things along the way. Those are the best type of projects, right? I won’t bore you with step by step instructions or anything like that here, because you can buy or get Anna Maria’s book from the library, as I did, and read through it yourself. I do want to share one trick, though, that I found to be excellent. Have you ever needed to iron the edges of a circle back for applique, or other sewing need, but could not get the edges to look decent as you burned the tips off all your fingers? Well, I found the solution in this book. 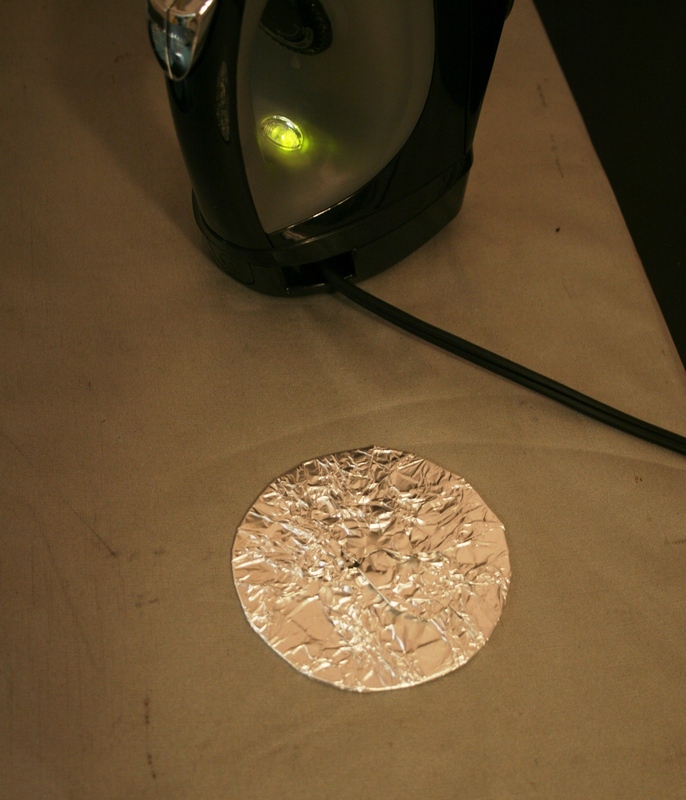 Use FOIL! DUH, Brilliant! Basically, you cut a cardboard circle in the finished size you need. 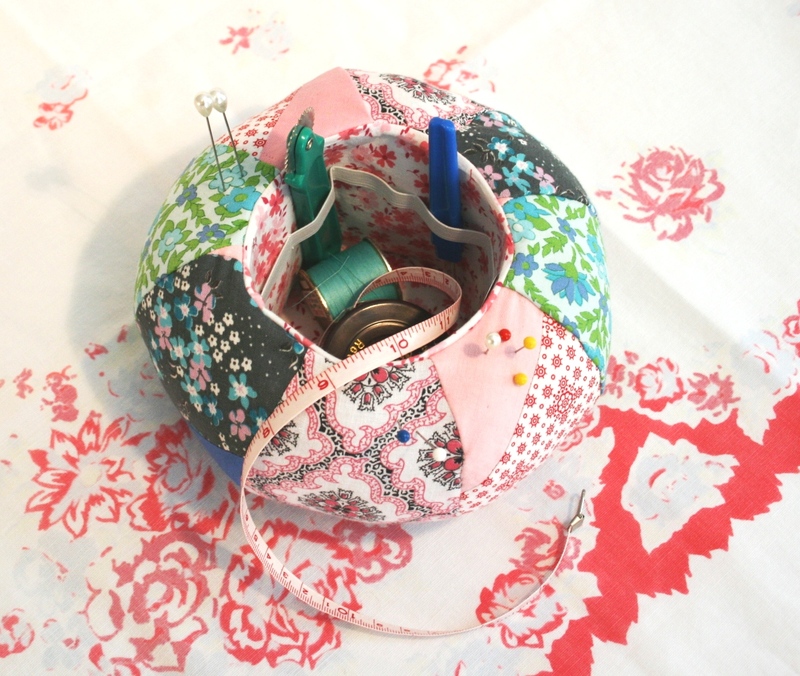 Cut a circle from the fabric you plan to use about 1/2 inch larger than the cardboard circle. 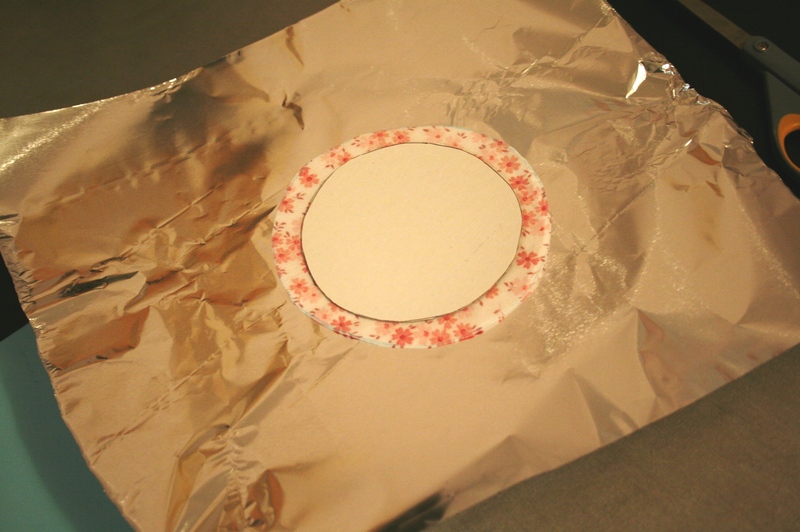 Stack the fabric, wrong side up on top of a small sheet of foil and then center the cardboard circle on top of the fabric. I quickly learned that this was entirely too much foil. 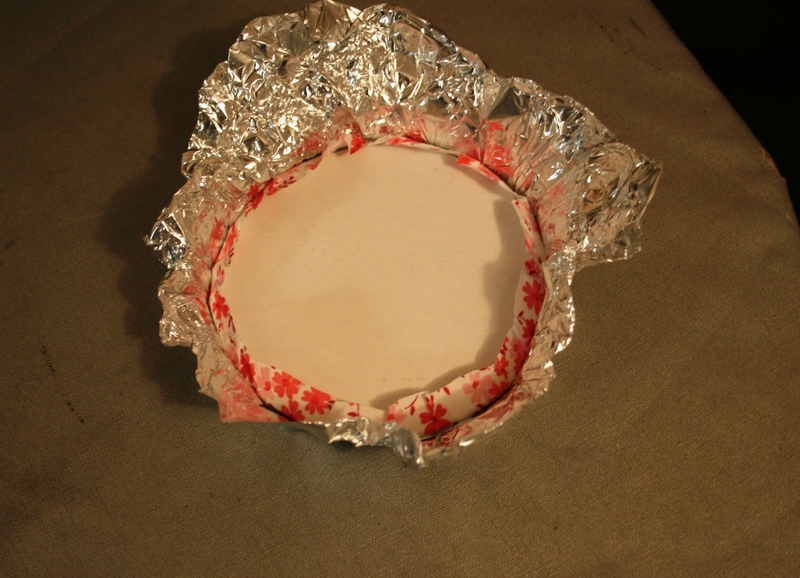 Take the foil and fold it up and over the edges of the cardboard circle, pulling the fabric taut with it. Smooth it out, iron it (carefully since, even though it’s aluminum, it does get hot!) and wholla! You have a very nice, ironed edge to your circle piece. That particular piece was the finishing part for the bottom of the pin cushion caddy that I made (see the last photo). Here are some pics of the finished product. I can’t wait to start using it. 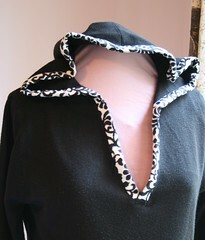 I did veer off from the original pattern in one way. I added a band of 1/4 inch elastic to the inner tube piece and tacked it at about 1/2 and 3/4 inch intervals to create a place to slide tools like a needle threader and seam ripper. That way they are easy to see and won’t go flying if your caddy gets knocked over. 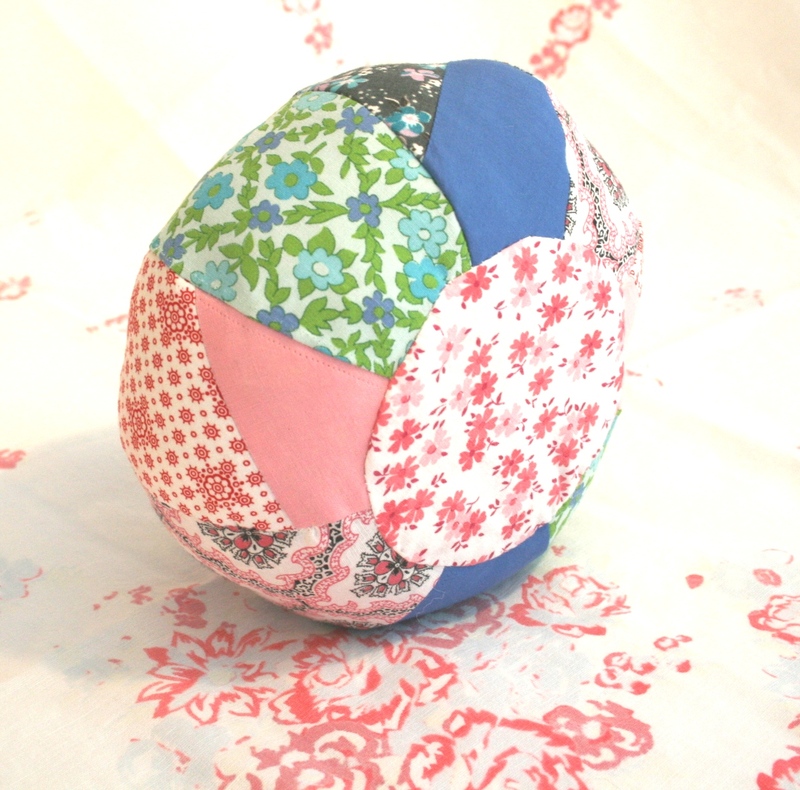 I used vintage fabrics and a pieced quilt square for the sections around the outside. The color combo is sweet, but the blues and grays keep it from being overly girlie. Or, at least that’s what I keep telling myself. Ok, off to the next project…or is it back to the embroidery? 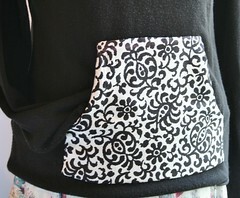 I love the idea of using foil to press hems for appliques. I would have never thought to do that on my own. It’s a great hint. Thank You! I just have to say that I have made 2 of these already but your caddy has to be the prettiest that I have ever seen!! It’s not an easy pattern and you have done a wonderful job! Well, thank you very much Libby! That was really sweet of you to tell me.